Nobody's Child sweeps you into a world where unprecedented choices never intended by heaven lead to unintended consequences never before seen on earth. Meet...Laura Ann McGehee---Determined to honor her father's dying request, the young West Virginia woman will do whatever it takes to save the family farm, including using the one remaining financial resource she has---her body. Sophia McQuistion---Thanks to the unusual sacrifice of a woman she has never met, she carries the child she could never conceive. Ian Stewart---In Laura Ann's time of need, he's more than just a close friend. He is a source of grace, a man who loves Laura Ann through her many trials. When unusual circumstances place Sophia's baby in Laura Ann's care, Laura Ann is now the virgin mother of her own biological son. The media call him 'Nobody's Child.' But somebody wants him badly enough to steal the baby.Weaving together bioethics and faith, Nobody's Child dramatizes a future that is already upon us with consequences we can no longer avoid. 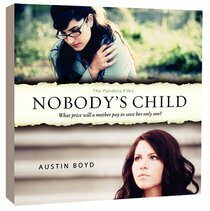 Customer Reviews For "Nobody's Child"
This book offers so much - there's romance, there's mystery, there's community, there's drama, there's a handsome devoted hero and there's two strong, brave heroines. To top it all off, it really makes you think! Without any judgement or criticism, it forces you to think about issues like surrogacy, IVF, sperm and egg donation, and the true meaning of motherhood. The author seems very open minded, presenting as many sides of these multifaceted issues as possible without preaching, condescending or lecturing, and then leaves you to make up your own mind. I couldn't put it down and can't wait for the next book in "The Pandora Files" series.